Whirlpool is taking the guesswork out of cooking at CES 2019 with the introduction of the Smart Countertop Oven. The smart appliance features food identification technology that automatically recognizes the type of food placed in the oven and selects the appropriate algorithm to control the cook time and temperature. It works with a variety of foods including chicken, pizza and broccoli – both fresh and frozen – and thanks to its convection heating system, there’s no need to pre-heat for certain food types. While compact in size, the oven is large enough to cook a whole chicken or a 12-inch pizza, we’re told, and features an easy-to-use touch-screen interface. 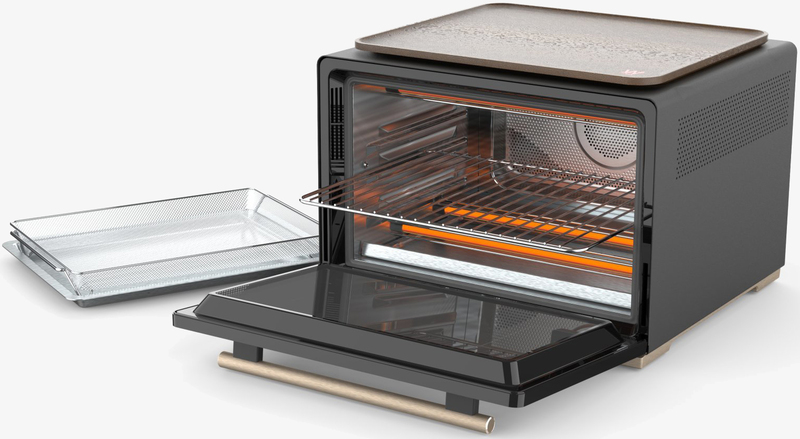 The Smart Countertop Oven also includes a built-in camera so you can watch your food cook in real-time, cooking status notifications sent to your mobile device, a food thermometer, hands-free functionality via Google Assistant and Amazon Alexa, nearly a dozen cook modes including bake, broil, reheat, dehydrate, air fry and slow cook, one-touch start and more. Interested parties can pre-order Whirlpool’s new smart oven from today for $799. No word yet on when it’ll ship.